It's and we would like to welcome you to the Salt Lake Tourist & Visitor Centers official online edition. 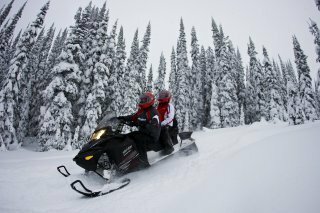 This page provides detailed information on hotels throughout Park City. The Salt Lake Tourist & Visitor Center's List of Hotels throughout Park City Utah. For business and leisure alike, Park City hotels are centrally located in the heart of the excitement. 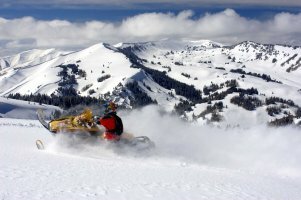 Enjoy a distinct variety of facilities and services - each uniquely tailored to your needs - at these Park City Utah hotels. One of Utah's premiere mountain resort properties, the luxurious Westgate Park City Resort & Spa boasts well-appointed accommodations from cozy guestrooms to spacious two-bedroom suites with fully equipped kitchens, whirlpool tubs, fireplaces and more, depending on the suite. Onsite amenities at the Westgate Park City Resort & Spa include ski valet service, the award-winning Westgate Grill, The Marketplace, Utah's largest indoor/outdoor pool, two hot tubs, fitness center, tennis court, basketball court, bicycle rentals, game room, pool tables and playground, as well as high-speed wireless Internet access, laundry facilities and a 24-hour front desk. 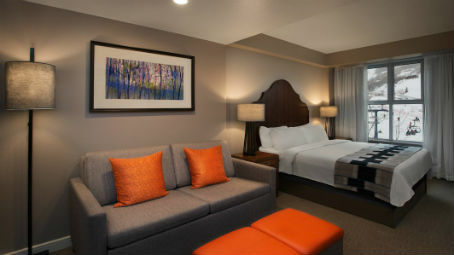 Experience the thrill of winter in an exciting & charming mountain town...welcome to the Hampton Inn & Suites Park City. Ready to enjoy a haven of extreme sports, award-winning dining and unbeatable shopping? Welcome to Park City. The Hampton Inn & Suites hotel in Park City is an inviting, stylish hotel adjacent to major shopping and within minutes of our ski resorts and numerous restaurants. Here at the Hampton Inn & Suites Park City, we're passionate about taking good care of you. That's why we offer a broad range of services and amenities to make your stay exceptional. 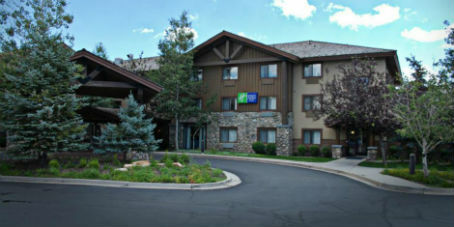 The Holiday Inn Express Hotel & Suites Park City Hotel is just off I-80 at exit 145. 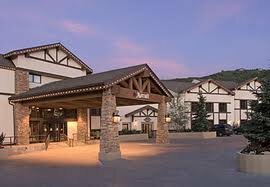 Located in Park City, UT at Kimball Junction, this Park City hotel is close to many restaurants and shopping centers. If you want to Ski Utah or Ski Park City and experience world class venues, we are convenient to Deer Valley and Park City Mountain Resort. Nearby is the Utah Olympic Park, the Alf Engen Ski History Museum, and the 2002 Eccles Winter Olympic Museum. Great winter children's activities include tubing and mini-snowmobile riding at Gorgoza Park or Soldier Hollow. Famous Park City shopping is close to the Holiday Inn Express & Suites hotel at the Tanger Factory Stores, the Redstone Plaza, and Park City's Historic Main Street. Welcome to Marriott's MountainSide in beautiful Park City, Utah. This vacation ownership resort features spacious villa accommodations and a prime location, ideal for families and outdoor enthusiasts. Our well-appointed 1- and 2-bedroom villa rentals offer deluxe amenities, including full kitchens, fireplaces, oversized soaking tubs and in-villa washers/dryers. Our cozy guest rooms feature kitchenettes and comfortable sofa beds. Every room has access to free Wi-Fi. Guests can enjoy the heated outdoor pool, modern gym and much more. Marriott's Summit Watch welcomes you with elegant accommodations and a prime location in Park City, Utah. Our premium vacation ownership resort is perfect for families and boasts guest rooms and villa rentals with a range of thoughtful amenities. Make yourself at home with full kitchens, washer/dryers and free Wi-Fi access in every villa. Warm up after a day on the ski slopes in front of the fireplace in your villa or make use of your flat-screen TV and DVD player. Other facilities at our ski resort include an indoor-outdoor connecting pool and a fitness center, as well as a whirlpool spa. * 220 guest rooms, suites and residences. * Location overlooking historic Park City. * Five restaurants, lounge and bowling alley. * 36 miles from Salt Lake City Intl. Airport. 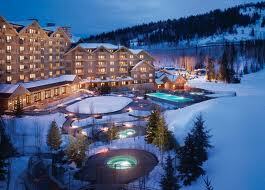 * 35,000 sq ft alpine inspired Spa Montage. * Over 55,000 sq ft of event space. The Park City Marriott boasts 191 guest rooms, which includes concierge level, concierge lounge, and 2 additional coin laundry rooms. Guest rooms feature Revive bedding, curved shower rods and curtains, stone top bathroom counters and lighting. For business travelers and pleasure-seeking vacationers alike, the Marriott Park City is the landmark choice of Park City Utah hotels, offering majestic views and world-class comfort in the heart of ski country. Experience the area's rich recreation by day, then retreat to the warmth and convenience of full-service luxury. 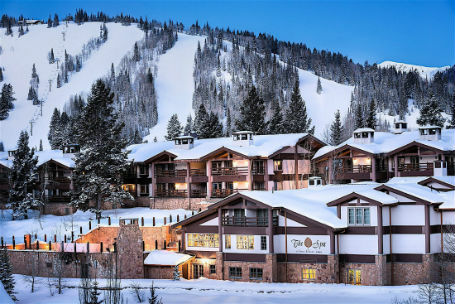 Ideally situated in lower Deer Valley and the private Deer Crest community, The St. Regis Deer Crest Resort pampers guests in a splendid setting with effortless access to a world of year-round outdoor sports and the vibrant town of Park City. Unwind in absolute luxury with ski-in, ski-out access to Deer Valley's impeccably groomed slopes, a private ski beach, split-level infinity swimming pool and adjacent hot tubs. Guests are surrounded in plush, residential-style comfort with expansive views of the Wasatch Mountains from 181 sumptuous guest rooms, including 67 spacious suites. Enjoy private or Juliette balconies, fireplaces, and signature St. Regis Butler Service. 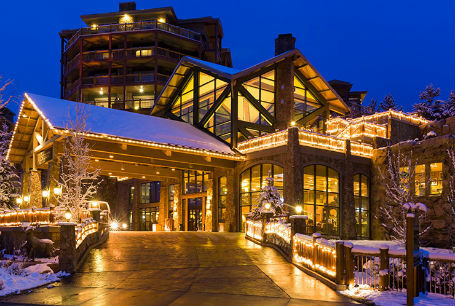 A Premier Year-Round Resort - At Utah's finest Forbes Five-Star hotel, guests experience the best ski-in/ski-out access, award-winning dining, indulgent treatments at Utah's only Five-Star spa, and entertaining apres, making Stein Eriksen Lodge a premier year-round resort. Stein Eriksen Lodge is an authentic European ski lodge nestled in the alpine beauty of Park City, Utah and surrounded by spectacular views of Deer Valley Resort. Named after Norwegian Olympic Gold Medal skier, Stein Eriksen, the Lodge was awarded "World's Best Ski Hotel" by World Ski Awards thanks to its impeccable service, world-renowned skiing, and access to year-round outdoor recreation. The Goldener Hirsch Inn, a AAA-Four Diamond Award winner, is an exclusive 20-room hotel nestled in the heart of Deer Valley Resort's Silver Lake Village. Combining the warm hospitality and intimacy of a country inn with personalized service and attention to detail for which European hotels are renowned, it is very similar in decor and service to its namesake, the Hotel Goldener Hirsch in Salzburg, Austria. The Goldener Hirsch Inn is the perfect choice for those wishing to experience the best of Deer Valley's world famous luxury. * "AAA Four Diamond Award Winner"
"The Goldener Hirsch Inn is geared toward the affluent traveler, and ... the service throughout the hotel is nothing less than outstanding."